The perfect complement for your kitchen faucet, this easy-push self-priming soap dispenser is ideal for dispensing soap onto a sponge or directly into the sink. The large-capacity bottle holds 12 oz. of liquid soap, lotion, or liquid detergent, and refills from above the counter for maximum convenience - simply add soap from the top of the dispenser, with no need to go underneath the kitchen sink. A threaded connection makes installation easy, with a tight waterproof seal above and below the counter to protect against leaks. The pump rotates 360 degrees, so you can position the nozzle anywhere you need it. Comes in a choice of five flawless finishes to match any kitchen faucet. Dimensions 3.5 In. X 2.2 In. X 11.9 In. The little things make life worth living. This is little soap dispenser is amazing. All you have to do is pop the top off and add your detergent. I specially wanted this because my new kitchen sink is on my island and wanted as little things as possible on there. Sorry for the mess, but my house was under construction. No big, ugly bottle of dish washing soap with this. If you're thinking of getting it, don't hesitate. It matches the rest of my stainless steel sink, faucet and appliances. This soap dispenser looks great with the KRAUS Oletto faucet next to it. That and a flush mount disposal button on the granite counter looks awesome. Good quality and good look. I am just finishing my remodel of my kitchen and purchased the Kraus soap dispenser. To my surprise it matched the Kraus faucet I purchased and is sturdy, easy to clean and holds more soap then any previous dispensers I have purchased in the past. I have been using this soap dispenser for about two months and haven’t had to refill the soap and it is working perfectly. Reviews for other brands indicated that they stopped working. This was the only brand with positive reviews. I have bought other Kraus products (bath faucet and kitchen faucet) and I love them all. The design and quality are excellent and the prices make them an excellent value. I am a designer and house remodeler, and I have purchased this clean-lined soap dispenser for many jobs because it has a very strong pump which allows for a unique installation as follows: I have always found that the soap container is much too small on all kitchen soap dispensers and requires constant refilling. But if you purchase a 30-inch length of clear plastic tubing that attaches to the bottom of this soap dispenser, you can put the other end of the tubing through the cap of a gallon jug of diluted dish soap which you then only need to refill once a year or less! My Home Inspector told me about this trick several years ago, and it works beautifully but only if you have a strong soap dispenser like this Kraus! I have shared this tip with my friends and clients and they all love the Kraus soap dispenser too! Soap dispenser matches my SS sink and faucet. It is easy to refill and very convenient. 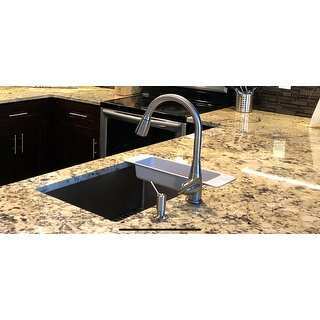 This does well to extend over the kitchen sink with its long dispenser arm, however, it is a little difficult to pump when you are reaching over a large set in kitchen sink. You receive a small amount of soap with one pump, which is good, since you don't waste and it doesn't drip on the counter top. It does take some effort to pump and I guess I miss my dispenser with the motion sensor. Oh well, this doesn't need constant changing of batteries and really is a clean look near the faucet. 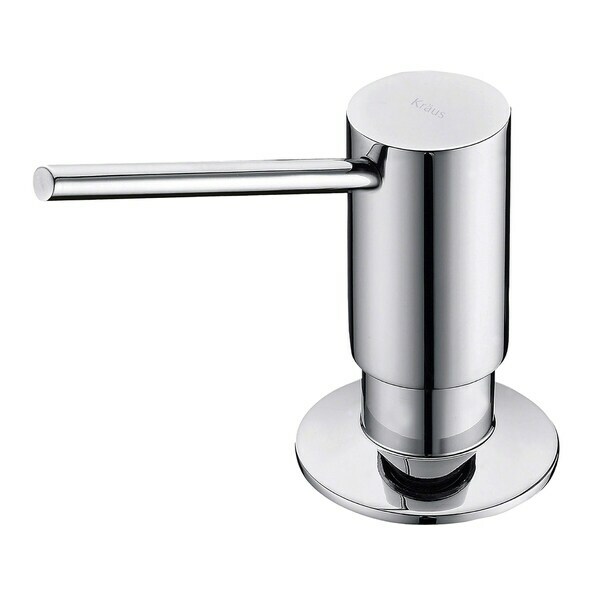 This soap dispenser is nice and compliments our Kraus kitchen faucet very well. The soap dispenser is nice because when filling it you don't have to get under the counter to unscrew it, but instead fill it from the top. I have one pump for dish soap, one for hand soap, and another for hand lotion. Great product. Nice stainless steel soap dispense. It looks like the images and dispenses soap as expected. 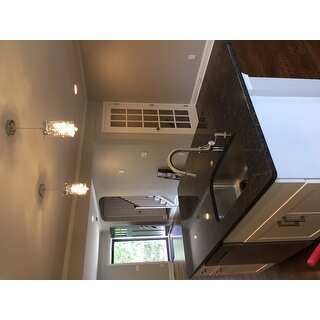 it is accurately stainless steel matching our stainless steel sink, facet, appliances, and pulls. It's super easy to refill after installed into your countertop. Just lift it up, pour in the soap and it's ready to use. i was skeptical at first to purchase this dispenser as people told me i would have to go under the sink to refill it. Nope! just pop off the top and refill from there ... no going under the sink. The dispenser is good quality. Great soap dispenser, matches faucet perfectly, easy to install. Sleek, modern and great quality especially for the price. My husband installed it in about 10 minutes and haven’t had any issues yet. Beautiful and great quality. Exactly what I was looking for. Love Overstock...great prices, great shipping and great customer service! Overall wonderful experience. I am glad I ordered this soap dispenser when I ordered the faucet. 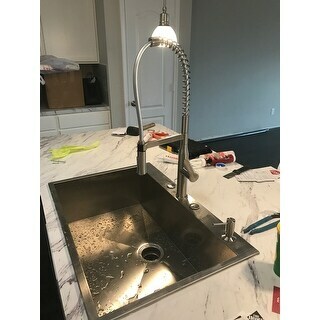 It has exactly same finish as "Kraus KPF-2631 Oletto 1-Handle 2-Function Sprayhead Commercial Pull Down Kitchen Faucet" and is very functional. It looks very good. Looks good, works just as expected. Just what we wanted when we remodeled our kitchen. The soap dispenser is perfect with my new quartz counters and new Kraus sink. The dispenser is easy to fill and works like a charm. This piece is kind of cheap feeling. The top of it rocks back and forth which is annoying. Looks nice though. Doing home improvements and kitchen sink was needed. This is a great soap dispenser. "Can you use foaming soap with this dispenser?" We would recommend a liquid soap in this dispenser. "what is the capacity of the soap reservoir in ounces." sorry, mine is installed behind a deep sink so it's hard to take out and check real capacity, and I don't have the box anymore but I'd say at least 8oz. "Is the chrome finish polished?" Yes, the chrome one, which I have, matches my other chrome sink items. It looks and works great. A quality piece. Enjoy! Does have a chrome finish. no, its not chrome. it's stainless steel. It will replace the sprayer of my current faucet.